In 2005 I suffered severely with arthritis in my spine, was unable to walk and was confined to bed. I resorted to a drug free, self-help approach (the Margaret Hills' Diet) to try and relieve the pain as I reacted badly to all prescribed medication. To my amazement, after three months of following the diet, taking a mixture of cider vinegar and honey regularly, doses of black strap molasses, Epsom salt baths and taking more exercise, my pains ceased. 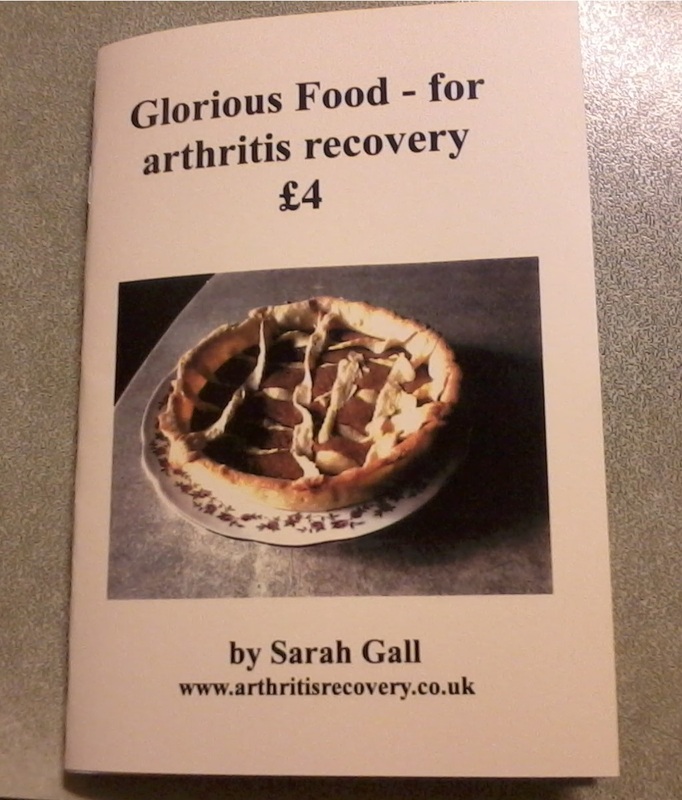 My 20 page booklet contains an account of my recovery, some of my favourite recipes, exercises that I found helpful and useful tips that helped me with the diet. Et skridt pa vejen til helbredelse af gigt. I try and cook all food from scratch and these are my favourite 56 recipes for soups, savouries, puddings, cakes and biscuits. 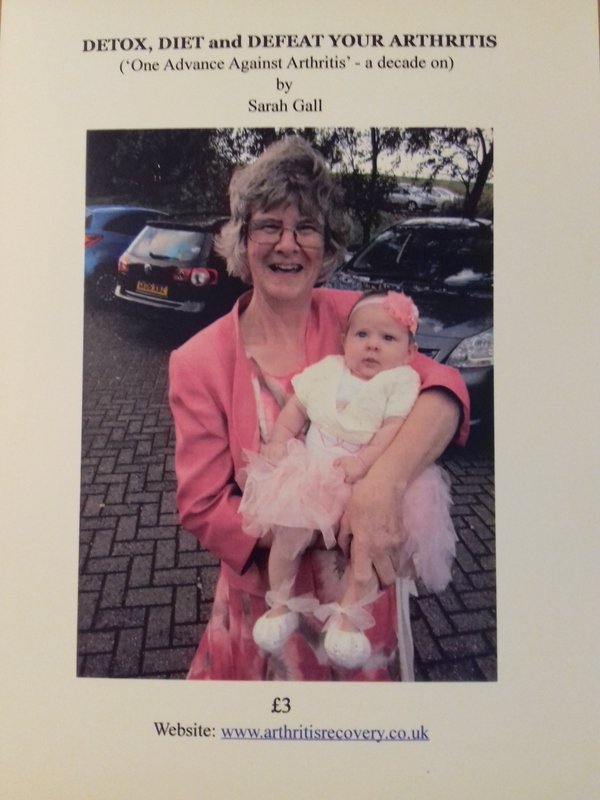 My third, newly published booklet is an update on my recovery from 2005 by following the Margaret Hills' drug free, self help method and my own thoughts and findings on this highly successful, holistic approach. 78 success stories ,so far ! I stopped work in 2000 because of painful rheumatoid arthritis and have been taking strong pain killers ever since (which do not cure the pain).I started taking Apple Cider Vinegar and honey in hot water, 4 weeks ago and started walking for pleasure after only one week. Before that I could only walk around my home and from the car to the doctors office and back again, it had gotten that bad. I had not walked for pleasure outside our home for 12 months and after one week, taking your remedy, I am now walking 30 minutes every night with my husband Jim and our dog Max.My husband, family and friends cannot believe the change in me and the improved quality of life I now enjoy.(Lynda,Brisbane,Australia). 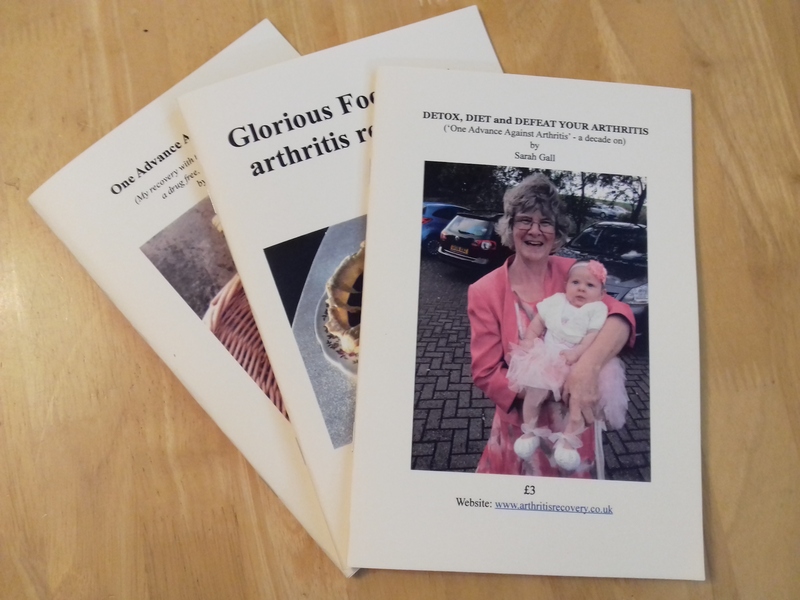 Since receiving Sarah Gall's book 'One Advance Against Arthritis' her advice has made such a difference to my arthritis that now my friends in the W.I and other organisations I attend want this little booklet. ....since contacting you recently the improvement in my hip joint has been remarkable...I started taking the cider vinegar, molasses and honey mixture immediately, cut out all alcohol and most acidic foods...within 10 days most of the pain has gone and the stiffness is easing. ‘after about three weeks I noticed a considerable improvement with the pain in my right leg… it is well worth trying… nothing to lose, as the honey, cider vinegar and molasses are all good for you. ‘I met up with a former pupil now in her 50's some weeks ago and found that she was in great pain as you were.I suggested that she check out the diet and I had a message from her last week saying that she is now drug and pain free ! I started the honey/cider vinegar treatment three weeks ago. After one week I felt a relief, after two weeks I was without pain, and now, three weeks later, I feel better than I have felt in a very long time. I thought you might like to hear that my husband is much improved since following your booklet,. He has, I am thrilled to report, abandoned his knee supports, and is now painfree. I have left getting in touch before now as I didn't want to jinx his recovery! however I shouldn't have worried as he really is like a new man. ...Since taking your recommended treatment I have not suffered with gout in any form.Also the arthritis in my neck and shoulder has eased considerably...I would recommend this treatment to anyone suffering the same condition and to give it a try.You have nothing to lose and all to gain.